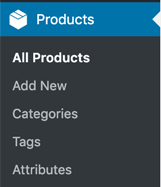 If you create “variable products” in Woocommerce, that is, products that have options, like t-shirts that are available in small, medium and large as well as red, green and blue, you can view these by going into a product and then finding the Product data box, clicking the Variations tab and looking at them there. But what if you just want to see all of the variations on your site, like you can easily get a list of all Pages or Posts from within WP Admin? That will take you to a list of all product variations. Enjoy!